He sits in the Tumbleform chair where we work on teaching him commands. In front of him today was this bright colorful drum. We asked him to bang on it and he did it over and over. We then switched arms and brought the drum to midline where he has the hardest time using his arms. Other than midline, Liam hit the drum every time we asked. He did so good today that he passed every goal she set for him!! 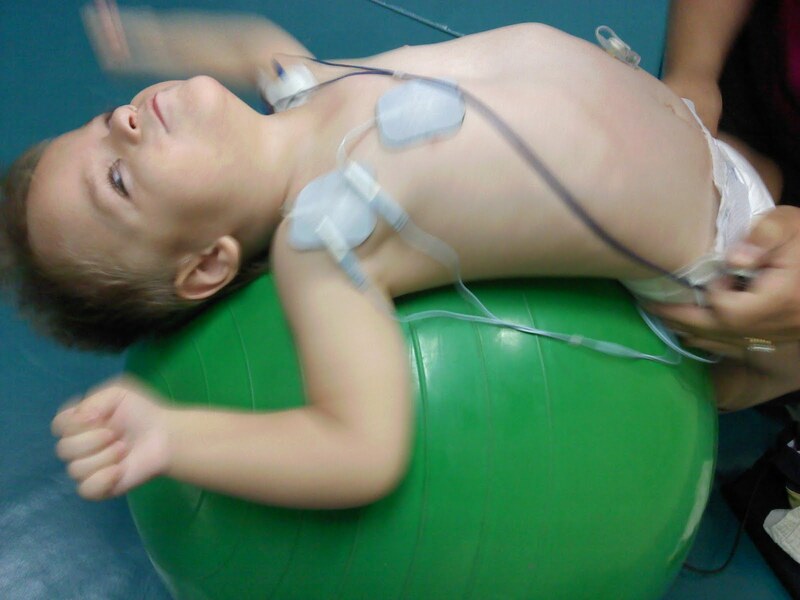 Next he moved on to physical therapy where we put the electrical stim on his pecs and biceps. 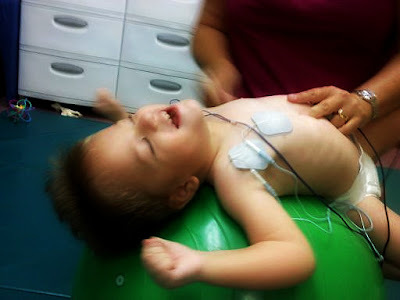 Because Liam is trying to roll independently from his back to his tummy, we are trying to help him use his arm better. His arm acts like an anchor and when he tries to roll it stays back behind him and prevents him from getting over. When we put the stim on, he can actually feel and respond to his muscles better and he will roll with his arm in front of him instead of behind. We do a lot of work on the ball where he can feel himself in space better than on the floor. It also gives him a bouncy place to help him work easier. You can see the stim pads on his arms. We also use them on his back to help him feel his back muscles in order to help him get strength in his trunk. 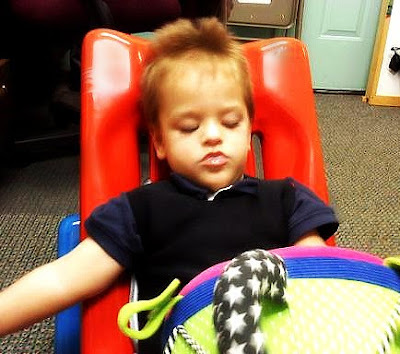 Next we moved to occupational therapy where today we focused solely on small muscle movements with his head and arms. Again, all while using the ball. By the end of OT today, Liam was done. It was the first time that Heidi had seen Liam get upset! 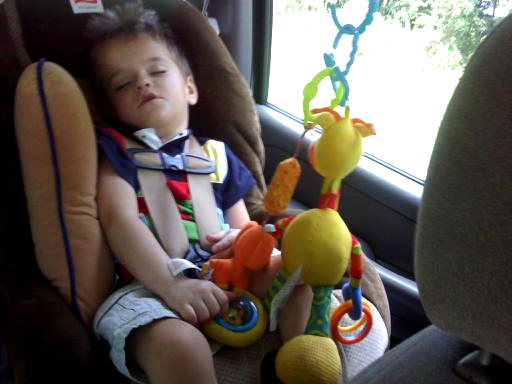 And then this was Liam ten minutes into our 45 minute drive home.